As a reviewer, I have the opportunity and honor of seeing the same show at different venues and sometimes I hate the show (not to be confused with the performances) and sometimes I love the show (again, not to be confused with the performances) but it’s rare that I hate the show at one venue but love it at another. However, this is exactly what happened with Fells Point Corner Theatre’s latest offering, I Hate Hamlet by Paul Rudnick, Directed by Mark Franceschini, with Set Design by Christopher Flint. 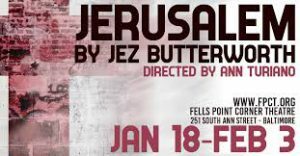 Not my favorite piece of theatre, Fells Point Corner Theatre’s production has changed my opinions and it’s a production I suggest you experience if you get the chance. I Hate Hamlet is about a young television actor, Andrew Rally, who rents the great John Barrymore’s old apartment in New York City as he prepares for the title role in Hamlet for Shakespeare in the Park. The only problem is, Andrew hates Hamlet. With the support of his aging agent, his upbeat, excited girlfriend, a shifty director-friend from L.A., and, oddly enough, his real estate agent, he tries to decide if this is the role for him. It’s then that the ghost of the aforementioned great John Barrymore comes for a visit to help Andrew discover he is good enough and even better than what people (and he, himself) gives him credit for. It’s a good story with a good message of self-worth that plays nicely. Set Design by Christopher Flint is excellent with levels and an attention to detail. Not only is it aesthetically pleasing, it’s quite functional working quite well with the blocking of this piece. Since the set is a major aspect of this show, being the former home of the legendary John Barrymore, it’s important to get it right and Flint has done just that with his choice of furniture pieces to his ornamentations and classic style. 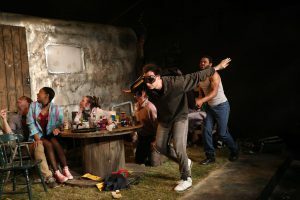 For a small (not micro, but small) space, Flint has used his space wisely and has created an appropriate setting for this production. Mark Franceschini is at the helm of this production and he has hit the nail on the head. His casting is outstanding and his comprehension of the text is apparent. Franceschini understands the witty humor involved in the text and guides his already apt cast in delivering it appropriately. The action keeps moving and the characters are authentic making for a delightful piece of theatre. Though a Costume Designer is not named in the program, it’s worth mentioning the Costume Design as it was realistic and well thought-out adding value to the production. Moving on to the performance aspect of I Hate Hamlet, this small ensemble of six really knocks it out of the ballpark. They work well together with good chemistry and seem to have a good grasp of their characters. J. Purnell Hargrove takes on the role of Gary Peter Lefkowitz, the sleazy L.A. directory trying to get Andrew back on to television, and does an admirable job with the role. Though, at times, he’s a bit too much and in your face for the intimate space, Purnell seems to understand the kind of man this character is and plays it with gusto. I will say, the touchy-feely-ness he portrays with Gabe Fremuth gets a little too creepy. Whether it’s an actor or director choice, I totally get the whole “sleazy” aspect, and it totally works for the character but… sometimes, less is more. Zarah Rautell takes on the role of real estate agent-turned-friend, Felicia Dantine. Rautell fits this role like a glove. Her comedic timing is spot on and she seems to embody this rough around the edges type character. The balance of edginess and tenderness she finds and portrays in this character is impressive. Lillian Troy, the very German and elderly agent to Andrew, is played by Kimberley Lynne and this performance is on point. She has the German accent down pat and her gestures and delivery of her lines are totally authentic. She, too, has terrific comedic timing and knows her character well. Next up is Abigail Wright as Deidre McDavey, the somewhat naïve, but kind and optimistic actress-girlfriend to Andrew. Wright is an absolute joy to watch in this production. Her upbeat, energized performance adds so much to this production and her delivery is spot on. I’d seen this character performed a very different way in a very different production but Wright has this on in the bag. Her energy alone, as she hops across the stage (and the furniture) gives a certain needed “oomph” to the entire production. I’m looking forward to seeing more from this actress. Andrew Rally, the television actor on whom this entire story is revolved, is played diligently and aptly by Gabe Fremuth, who embodies this character with a lack of self-confidence. He finds a good balance of fake confidence and vulnerability that makes this character endearing and has you rooting for him. He has a good look for the role and gives a strong, confident performance, comfortable with the text and the character. He has a great chemistry with his cast and does well with this character. 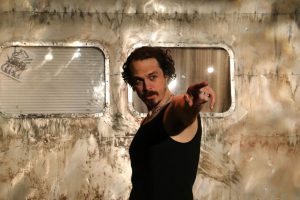 Rounding out the ensemble is the incomparable standout of this production, Steven Shriner, who tackles the complex but common sense role of John Barrymore, who some consider was the best Hamlet to hit the stage. Shriner pulls this role off beautifully and is totally believable as the ghost of Barrymore. His comedic timing is second to none and he seems to have a complete comprehension of this character and the story of I Hate Hamlet. He is confident and comfortable on stage and delivers his lines clearly with purpose. He mixes this character with humor and poignancy and his balance of both is superb. He is certainly one to watch in this particular production. Final thought… I Hate Hamlet is a humorous, but serious look at and partly analyzes one of Shakespeare’s most famous and popular plays in an easy, understandable way but, through this Shakespearean tragedy, also teaches us a little about ourselves and what we’re capable of doing in today’s modern world when we think the odds are against us. The story moves along nicely and the performances are strong and confident with a sturdy, impressive set and a fantastic costume design that makes for an exquisitely delightful evening of theatre. This is what I thought of Fells Point Corner Theatre’s production of I Hate Hamlet… What did you think? Please feel free to leave a comment!